Artek is celebrating the 100th anniversary of Finnish designer Tapio Wirkkala's birth by re-releasing a set of glass lampshades he created in the 1960s. A leading figure of the post-war design movement in Finland, Wirkkala's range of work included glassware, jewellery, sculpture and furniture, and encompassed everyday objects such as stoves, fridges and electric switches. Among his best-known projects are the Finlandia vodka bottle and the Finnish markka banknotes from 1955. To celebrate what would have been his 100th birthday this year, Finnish furniture brand Artek is relaunching his K2-140 glass shade. 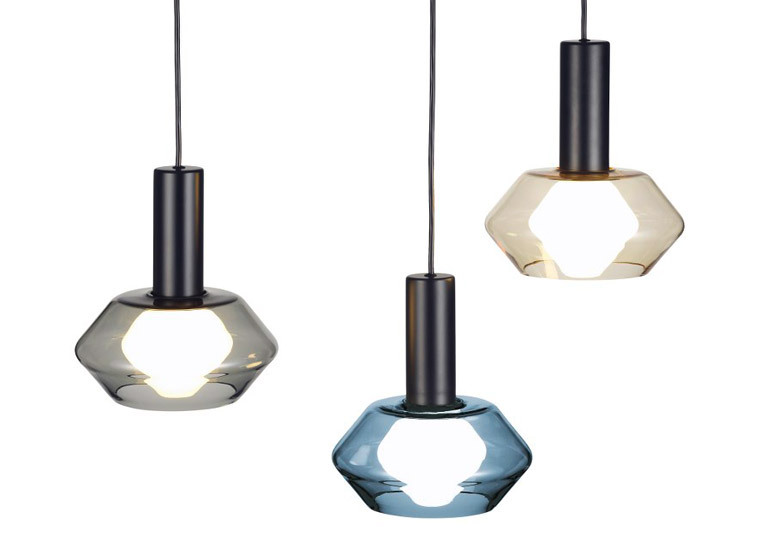 The coloured diffuser was created as one of many designed to cover the WIR-105 diamond-shaped lightbulb – part of the the designer's TW003 pendant lamp. Wirkkala, who died in 1985, won the Grand Prix at the 1960 Milan Triennale for the bulb. Artek developed an LED version of the bulb and re-released the pendant in 2013. Shaped like a stretched version of the bulb, the K2-140 shade is designed to show off the unusual light source through its tinted glass surface. The lampshades will be available to purchase in grey, blue and amber versions from October 2015. Originally trained as a sculptor, Wirkkala's career as a designer took off after the second world war, when he spent time working in New York for industrial designer Raymond Loewy. During his lifetime he produced designs for companies including Finnair, Iittala and Rosenthal, and served as an artistic director of the University of Arts and Design in Helsinki for many years. Artek described him as "an artist of great diversity for whom no material was alien and who left no area of design unexplored". Artek was set up by Finnish Modernist designer and architect Alvar Aalto, his wife Aino, Maire Gullichsen and Nils-Gustav Hahl "to sell furniture and to promote a modern culture of living by exhibitions and other educational means". The company – celebrating its 80th anniversary this year – was acquired by Swiss furniture brand Vitra in 2013, along with the production facilities used by Aalto to develop his signature bent-wood furniture a year later. Artek has since relaunched a range of products by Aalto, as well as introducing new collections with designers including Konstantin Grcic and the Bouroullec brothers. It is the latest Scandinavian company to capitalise on the 100th anniversary of the birth of a famous Modernist designer. For Danish designer Hans J Wegner's 100-year celebrations last year, Carl Hansen & Søn adopted a logo he designed for the brand in 1950 and PP Møbler relaunched a collection of his best-known designs.